'One Mile Race' en Praga - Bicivilizados. Ciclismo urbano. Alegría entre tus piernas. 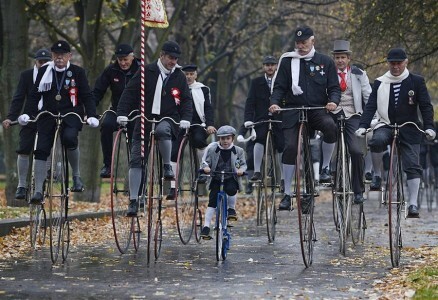 A young cyclist is flanked by fellow Penny Farthing bicycle riders during the annual ‘One Mile Race’ in Prague, Czech Republic, on November 2, 2013. Participants dress up in historical garb and ride on high wheel Penny Farthing bikes.